Business trends are constantly evolving, and office design is a part of that evolution. Companies are always trying to determine the best possible workspace layout to not only foster great culture, but also to encourage productivity. Another reason office design is considered so carefully is for encouraging collaboration. This is especially important today, when agility, innovation, and responsiveness are fundamental elements of any workspace. The last major office design trend was for open spaces. Businesses replaced impersonal cubicle walls with open spaces that were supposed to encourage collaboration. Walls came down and, unfortunately, so did productivity. Open offices do not work. Employees need spaces to collaborate and work on projects, but there needs to be a careful blend of transparency and privacy. The major drawback of open office floor plans is the lack of privacy. Noise, interruptions, lack of privacy—are all cited as complaints against open floor plans. It’s far more difficult to tune out background noise and get work done when there are no walls or private spaces to which one can retreat. Despite these complaints, one of the biggest reasons many companies choose to stick with open office floor plans is simple—it encourages collaboration. It’s easier to get a colleague’s input by simply turning and starting a conversation than it is to get up and go over to his or her desk, or start an email conversation. Open office floor plans may have more drawbacks than benefits, but truly collaborative spaces are invaluable in the modern business world. So, how do we make this work? Smart conference rooms, which enable telecommuters to participate in brainstorming and other work processes. Campfire-like seating with digital whiteboards. 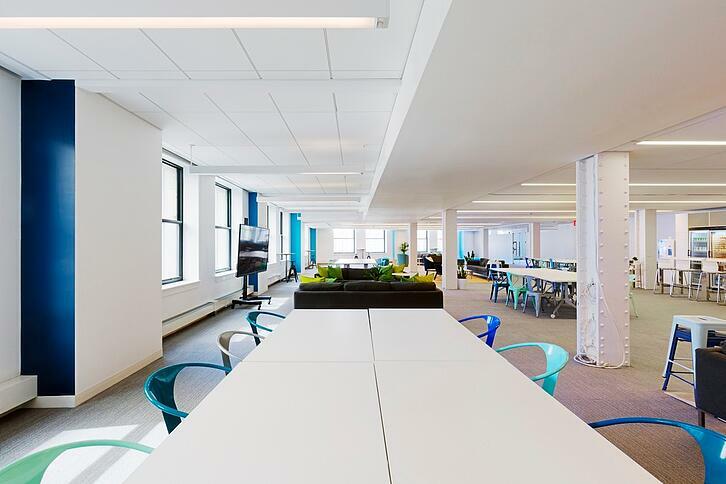 Open spaces with collaborative digital whiteboards, surrounded by seating will be comfortable spaces for teams to work together on shared projects. Huddle rooms, which are essentially mini conference rooms. Most huddle rooms will have a smartboard for the group of four or five employees to use, along with easy connectivity for devices and laptops. Offices without walls. Businesses with a remote workforce are extremely common now, and with collaborative technology that seamlessly transitions from a work office to a home office, expect to see this even more. When businesses create spaces like these, they are essentially allowing employees to work in ways that are most comfortable to them, while simultaneously encouraging collaboration. With the right technology, the right environment, and the right culture, collaboration can be seamless. That’s what the businesses of today need. What about your office space? Is it designed to foster collaboration and communication, while also providing privacy and “thinking space” for employees? What challenges when it comes to office design have you encountered? How have you faced those challenges? We’d love to hear your thoughts on this.